How do you access your journals and magazines? There are a number of options. If you know the title you can do a keyword search in Library Search. Your subject guide is a ‘one stop shop’ for all resources and includes a tab to link to core journals, journal collections and magazines such as those in Art and Architecture Archive and the Avery Index. You can also view the list of print journals and magazines that we have in the Library. 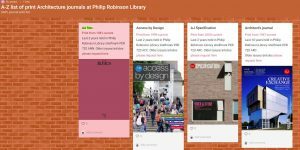 If you like to browse individual Architecture or Planning journals, then take a look at Browzine. 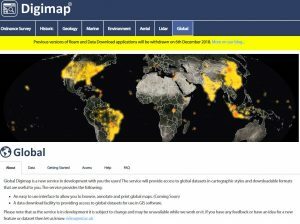 The suppliers of Digimap have given us trial access to their new Global data for this academic year. The product is now available when you log into Digimap. The service will provide access to global datasets in cartographic styles and downloadable formats that are useful to you. 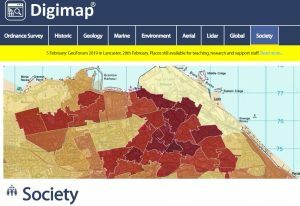 For more information about maps and to access Digimap please see our maps Library Guide here. Environmental Studies in Video contains 500 hours of film covering all realms of environmental studies, particularly ethics, policy, economics, law, sociology, planning, and environmental science. The collection addresses specific topics including alternative energy, pollution control, eco-design, sustainability, farming and agriculture, the food industry, LEED certification, waste issues, and climate change. We have access to this collection until 31st December. To access the collection, click on the link here . If you are off-campus, you will need to log in to RAS first of all, and then access this page from within RAS. The trial ends on December 31st. Please explore and email us your feedback, or post it as a comment on this blog. We have access to this resource from 12th November until 31st December. Social Theory is an online collection designed to provide comprehensive coverage of major social thinkers together with seminal texts from lesser figures. For many writers, the project represents the first availability of a major scholarly edition of their collected works. Readers can see both the original works and translations, searchable together in a single online collection for the first time. Essential for study in the areas of politics, economics, history, psychology, anthropology, religion, and literature, the works of many important thinkers in sociology have remained inaccessible until now. The collection includes the works of Max Weber, Karl Marx, Jürgen Habermas, Robert Merton, George Herbert Mead, Auguste Comte, Jean Baudrillard, Georg Hegel, Herbert Spencer, Antonio Gramsci, Mary Wollstonecraft, Alexis de Tocqueville, Harriet Martineau, Georg Simmel, Emile Durkheim, Anthony Giddens, Simone de Beauvoir, Norbert Elias, Michel Foucault, Peirre Bourdieu, Theodor Adorno, and thousands more. To access Social Theory, click on the link here . The trial ends on 31st December. Please explore and email us your feedback, or post it as a comment on this blog. If you are off-campus, you will need to log in to RAS first of all, and then access this page from within RAS. We have access to this database from 12th November until 11th December. To access the database, click on the link here and select ‘Client log in’ (top right corner). You will need to be on campus to access the database or if you are of campus please access via RAS. The trial ends on December 11th. Please explore and email us your feedback, or post it as a comment on this blog. We have access to this archive from 12th November until 31st December. The LGBT Magazine Archive includes the backfiles of many of the leading, established, long-running periodicals of this type. Coverage is from the first issue of each publication, with the earliest content dating from 1957 and the default termination point for each title is 2015 (or the journal ceased date). Each issue is scanned from cover to cover in full color. Magazines of this type have been a crucial source of identification for many LGBT people; they chronicle the evolution of myriad aspects of LGBT history and culture, including law/politics/society, the arts, health, and, lifestyle. Whilst this material will be indispensable for dedicated LGBT studies and broader gender/sexuality research, it will, additionally, cater to interests in many related disciplines, including 20th-century history and culture, sociology, psychology, health, and literature/arts. Crucially, the pre-eminent publications from the US and the UK are included – The Advocate and Gay News/Gay Times respectively. To access the archive, click on the link here. If you are off campus you will need to log into RAS first of all, and then access this page from within RAS. We have access to this database from Monday 12th November until Sunday 25th November. MarketLine Advantage is a multi-disciplinary online database that you can use for a wide variety of content such as industry, country, company reports and case studies. To access the database, click on the link here . If you are off-campus, you will need to log in to RAS first of all, and then access this page from within RAS. The trial ends on November 25th. Please explore and email us your feedback, or post it as a comment on this blog. We have trial access to this resource from 12th November until 11th January. Types of buildings include: housing, schools, libraries, office buildings, sacred buildings, museums, industrial complexes, infrastructure, transport and other building types. To access the database, click on the link via Library Search. The trial ends on January 11th. Please explore and email us your feedback, or post it as a comment on this blog.